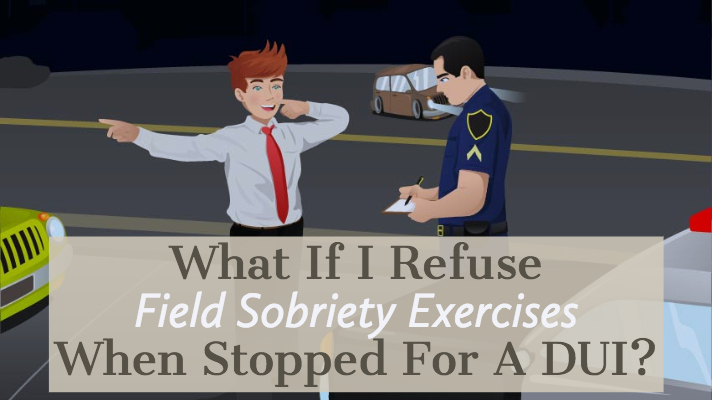 What If I Refuse Field Sobriety Exercises When Stopped For A DUI? What are Field Sobriety Exercises? Field Sobriety Exercises are physical tasks that an officer will ask you to perform when that officer suspects that you are driving while under the influence of alcoholic beverages or drugs. Some of the exercises are standardized, meaning that the instructions and the way they are conducted are the same everywhere in the United States. Some of the exercises are not. Some examples of Field Sobriety Exercises are the Walk and Turn exercise, the Finger to Nose exercise, the One Leg Stand Exercise, the Rhomberg Alphabet exercise, and the Rhomberg Balance exercise. Each exercise is designed to divide your attention so you are concentrating on different tasks. For example, during the walk and turn exercise, you have to listen to instructions, remember to keep you arms by your sides, place one foot in front of the other heal to toe, walk down a line, take 9 steps, turn taking small steps during the turn and take 9 steps back, all while not swaying, raising your arms or stopping. The officer will mark down each thing that you do wrong and will form an opinion on whether you are impaired or not based on how you do on the Field Sobriety Exercises. In the real world however, the officer may have already formed an opinion about whether you are impaired before you ever start the field sobriety exercises and they may use the results of the field sobriety exercises to gather evidence against you. How are Field Sobriety Exercises used in a DUI case? So, after pulling you over for a traffic infraction, or otherwise coming into contact with you, the officer will ask you to perform field sobriety exercises, based on his or her initial observations of bloodshot watery eyes, slurred speech, swaying, flushed face, etc. If you refuse, the officer will either arrest you or let you go based on the evidence of impairment the officer has at that time. More than likely, the officer will arrest you and base the arrest on his observations and your refusal. Instead of having evidence of impairment from the field sobriety exercises, the officer will have evidence of refusal to submit to field sobriety exercises. If you consent to the Field Sobriety Exercises, the officer will notate each thing that you do wrong and will use that against you in court, along with his or her observations. Once arrested, whether you submit to Field Sobriety Exercises or not, you will be taken to the the jail and asked to submit to the breath test. Either the results of the breath test or a refusal to submit to the breath test can be used against you. Even if you blow .000, you are still under arrest and will have to go before a judge. If you do blow below a .08, the police will likely ask you to submit to a urine test. If you refuse the Field Sobriety Exercises, the negative consequence is that a prosecutor can argue to a jury that you refused because you knew you were impaired. In other words, the State can use the refusal against you in court. However, you are entitled to offer a defense. So, if you refused for a reason other than being impaired, you could testify and explain to the jury why you refused. For example, if you felt intimidated by the officer, or have a medical or physical disability, or if you have balance issues. These may all be valid reasons why a person would refuse to submit to the field sobriety exercises. You may also have wanted the field sobriety exercises videotaped. Some officers have video cameras, or dash cams, that record the field sobriety exercises. Oftentimes, those videos become a focal point for the defense. They can contradict the officer’s testimony and show good performance. Unlike refusing to take the breath test, your license will not be suspended simply for refusing to perform field sobriety exercises. It will simply be used against you in court. If you refused because of a physical or medical issue, the State can still argue that you refused, but your statements why you refused should be admitted into evidence as well. Then it would be up to the jury to decide whether, along with the other evidence, you refused because you knew you were impaired, or whether you refused because of another reason. Jeremy Lasnetski, managing partner at Shorstein, Lasnetski, & Gihon is a Florida Bar Board Certified Criminal Trial Lawyer and has been practicing criminal law in Jacksonville for over 16 years. 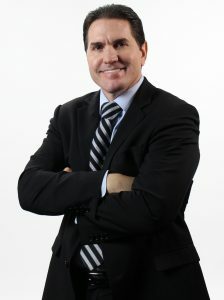 Mr. Lasnetski received his Bachelor of Arts degree with honors from the University of Florida in 1997 and went on to obtain a law degree and an M.B.A. from the University of Florida in 2001. After graduation, Mr. Lasnetski accepted a position as a prosecutor at the State Attorney’s Office in Jacksonville. During the next 6 1/2 years as a prosecutor, Mr. Lasnetski tried more than 50 criminal trials, including more than 40 felony trials. He was promoted in 2007 to Division Chief of the Repeat Offender Unit. Mr. Lasnetski was also a full time member of the Homicide Prosecution Team. In 2008, Mr. Lasnetski formed the Law Office of Shorstein & Lasnetski and began defending citizens in criminal court. He represents clients in both State and Federal criminal courts.